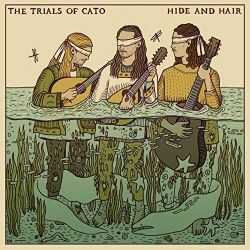 New folk trio The Trials Of Cato have one of the more unusual backstories for a band. Although all three members were born in the UK they met and formed while living in the Lebanon taking their name, if memory serves, from one of their landlords and his tribulations, real or imagined. Since their return to the UK they’ve started to make a serious name for themselves on the festival circuit and with their first EP. Said name is amply justified by this, their debut album. Theirs is a pleasingly robust style of both playing and singing – no risk of tweeness here – and is influenced not only by the obvious folk reference points but also 60s and early 70s Americana outfits as well as the occasional touch of the Eastern. A mix of traditional and original songs, there are particularly good versions of ‘Tom Paine’s Bones’ and ‘My Love Is In Germany’ and the excellent opening instrumental ‘Difyrrwch’, a mix of Welsh and English traditional tunes, makes for a great entrance to the album. Poise, a bit (but not too much) swagger, fine playing (mandolin, bouzouki, guitar, banjo) fine singing, fine songs, The Trails Of Cato are going to be around for a long time. Excellent stuff.